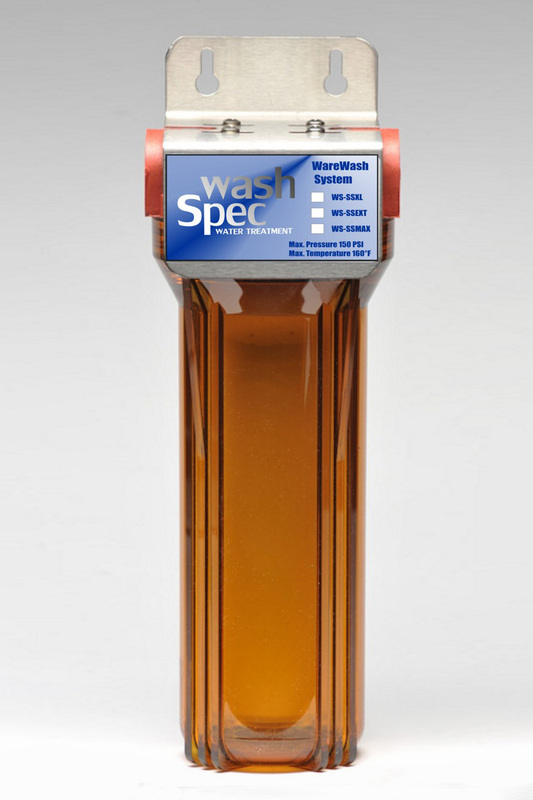 WashSpec™ Warewash Systems utilize HydroBlend™, effectively controling mineral scale deposits in plumbing systems and water-fed equipment. HydroBlend™ is specifically formulated to work in high-temperature / high-hardness environments providing unparalleled mineral scale prevention and corrosion control. HydroBlend sequesters scale-causing minerals making them more soluble in water thus reducing the chances of precipitation as hard mineral scale. In the event that scale causing minerals do precipitate out of solution, HydroBlend distorts the shape of the scale crystal so that it cannot build up on itself. HydroBlend provides corrosion control by forming a protective micro-thin glass-like lining on wetted surfaces acting as a deterrent to corrosion and scale. HydroBlend will also help soften and remove existing mineral scale deposits. HydroBlend is utilized in a solid block cartridge form, exposing to the water a predetermined amount of surface area, from which accurate feed rates can be predicted. HydroBlend Systems allow various configurations to meet most treatment requirements with the goal of obtaining proper feed rates for desired treatment volumes. HydroBlend Systems provide effective scale prevention and corrosion control for various applications at a fraction of the cost and maintenance of other technologies. As a ‘threshold treatment”, HydroBlend Systems are sized based on water usage and flow rates, not water hardness, so there is no added expense with harder water. When the cartridge has dissolved, it is replaced. A quick glance at the high-temp translucent housing indicates when cartridge replacement is needed – no electricity, drain lines, maintenance or guess work is required. Install the WashSpec™ Warewash System prior to the booster heater protecting both the booster heater and the dish machine.